The civilian clad VC terrorist had just murdered many family members of S.VN soldiers along with the serving S. VN military people who were captured unarmed. He was caught at the scene and admitted what he had done. The terror attack of Tet 68 was still in progress. The General had every right by military S.VN law to execute him. Even they are ashamed of it. The leftist press hid the truth about the photo, used it to aid their Communists for their own reasons. Cool photo. Well done, loan! This quote from the first comment pretty much reinforces the entire problem with this issue and many similar ones. Absolute and 100% incontrovertible proof does not and will never exist. We only have accounts of people who were apparently there and witnessed it. But that’s just how the world works I guess. Pingback: Vietnam Execution | Who am I? No war crime there. Any person who is found behind the lines of a belligerent without a proper uniform and is proven to be an enemy soldier/agent, he is considered a spy and is therefore NOT eligible for treatment as a POW. Summary executions can apply if the captor wishes to do. Lem was found with a bunch of dead familes and VC police officers and was captured in civilian clothing behind South Vietnamese lines. He’s not only a spy but a war criminal as well. Sadly, that happens with a lot of video embeds … the digial oubliette. I replaced it with another clip. You might want to take down the video of the “shooting,” as the account of the person who posted it has been terminated, so the video is no longer available. Susan Sontag’s book, Regarding The Pain Of Others maintains that this photo was staged. The prisoner was led out to the street where a group of journalists were waiting. What I found hard to stomach was the war crimes museum in Ho Chi Minh. There was no war crime here, however shocking the action may have been. A combatant in war, as Lem was, is required under the laws of war to fight in a clearly recognizable uniform. Lem was waging war in ordinary clothing, for the purposes of not being recognized as a combatant. Under the laws of war, such a combatant has no rights under the Geneva Convention or any other protocol. They can be summarily shot if the captor so chooses. And so they chose. War is stupid, when will man accept this and refuse to go off to fight for some rich jerks. Gen. Nguyen Ngoc Loan should have been tried for war crimes. Just why did the story come out that Nguyen Van Lem (the Vietcong captive) was a murderous person? I suppose that these are only the words of the general in defense of himself specially when his American neighborhood learned of his real identity. Yes, this photogaph is power full, but a photograph is like a book. One has to read the whole book to understand it. The executed individual was a Viet Cong member. The Viet Cong did one thing and one thing only, which was to murder innocent members of the legitimate government of South Vietnam. It’s an amazing composition; that just makes its spontaneity so much more remarkable. This would be a completely different picture if the executioner’s chest and/or the prisoner’s back faced the camera. War sadly is war, whether you photograph it or you don’t photograph it. In my opinion, this is easily the most powerful photograph of all time. The calmness of General Loan sandwiched between the tension on the faces of the soldier on the left and Nguy?n V?n Lém just speaks volumes about how treacherous this war was. Everytime I watch the video, I still jump when Loan fires the shot. The fact that there were “many summary executions” without trial does not excuse this one. The “But mom, all the other kids are doing it” defense has never been accepted in a court of law. The only evidence we have that the victim was a criminal is from the mouth of his killer. 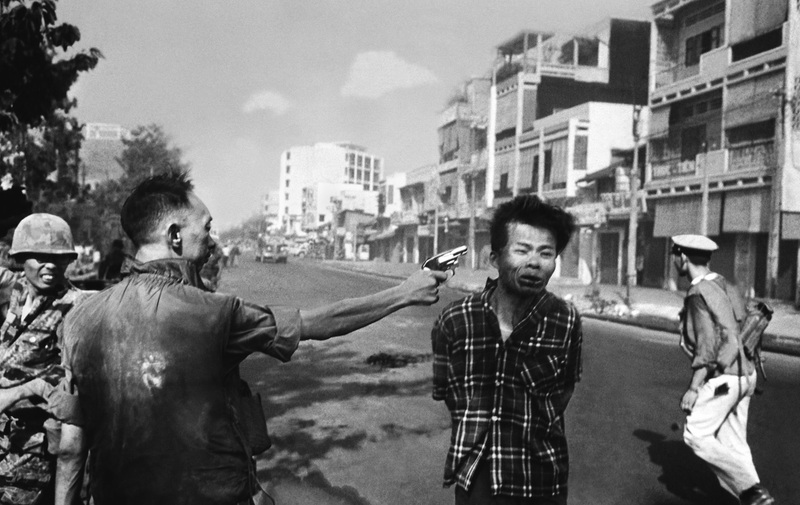 Nguyen Ngoc Loan never faced justice for his murder, and in fact lived out a life of relative ease in the United States. He should have been tried for war crimes.